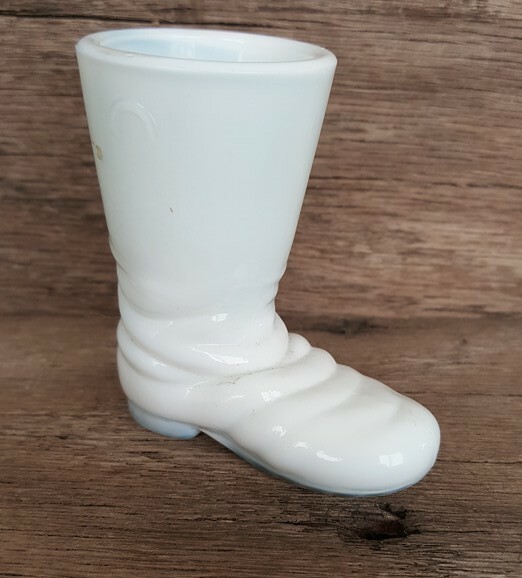 Degenhart Texas Star Boot Toothpick Holder in Milk Glass, Bargain Shack offers Boyd Glass, Mosser Glass, L.G. Wright, and Contemporary Collectible Glass including Vaseline Glass - J.B. Scottie Dogs, Pooche, Animal Covered Nests, Toothpick Holders, Salts, Glass Animal Figurines, Clowns, Dolls, Slippers, Vehicles, and More! This is an original Degenhart Texas Star Boot in class milk white. It was manufactured in Cambridge, Ohio and stands 2.5 inches tall. When Mrs. Degenhart decided to go out of business she sold it to Bernard Boyd in 1978 and he changed the mould mark to his diamond B logo. This boot has the Degenhart D in a heart and a star on the sole of the boot near the toe. It is a great piece of Ohio history.